Now you can enjoy the excellent audio performance of TI's new PGA2310 chip, and the convenience of IR remote control. New IRVC chip combines a Learning IR remote control recognizer with the logic needed to control TI's high-performance digital volume control IC. IRVC can also be used with the CS3310 chip from Crystal Semiconductor. This photo shows a populated IRVC pc board. IR sensor and Learn PB switch can be seen near top right corner. TO-92 5 volt regulator is at top right corner of pc bd. Includes 8" 3-conductor ribbon cable. PC-RS2 is approx 0.5" by 0.9", with a single mounting hole. Allows mounting Vishay IR receiver and electrolytic bypass capacitor remotely from main IRVC pc board, in case that is needed. Please download parts placement guide. Note: All parts needed to populate pc board, except the IRVC chip and the Vishay IR receiver module, can be purchased at www.Digi-Key.com. The IR receiver can be purchased at www.Mouser.com. Of course, the easiest way to get going is to purchase one of our complete kits. Includes IRVC Chip, PC-IRVC pc board, and all components needed to populate board, 12" ribbon cable and female connector for PC-IRVC board end. Please download chip data sheet, assembly instructions, schematic diagram, parts list, and parts placement guide. 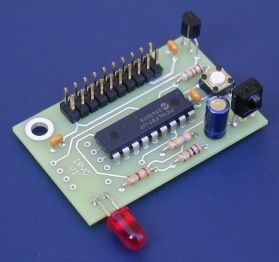 Note: You will need to connect this board to either one or more TI PGA2310 chips or one or more CS3310 chips to implement a working volume control. These parts are not on the IRVC pc board and are not included in the kit.